On his way to a horse show my youngest man-child stopped by one day last week with the back of his truck full of some wonderfully-aged horse manure. Thank you, dear child of mine! He happens to be a real-life cowboy who trains reining horses. 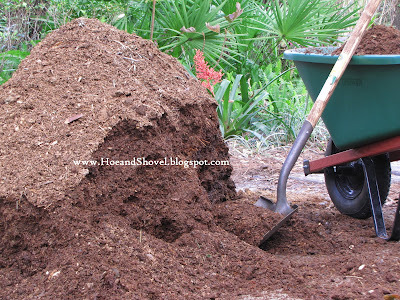 One of the benefits of horse manure in the garden is that it contains many of the micro-nutrients (boron, copper, chlorine iron, manganese, molybdenum, and zinc) that we hear less about while also adding to the composition of the soil. In addition it helps the soil hold moisture and promotes easier, and healthier root growth. It is suggested never to use fresh manure because it is considered very "hot" (high in nitrogen) and can burn your plants. Fortunately this delivery was light and airy as it had been decomposing for several months already. Most of it went on the new berm I'm building on the north side of the back yard. Some of it went into the compost pile ~~ just for fun~~ and several loaded wheelbarrows of it went straight into established planting beds as a top layer. These are the things that make a gardener joyful, gleeful, and just plain exuberant!!! At the same time the landscape is singing hallelujahs for the added nutrition. That's good stuff! You're so right that is needs to age. I've seen smoke coming out of a pile of hot manure before. PS I used to breed Arabian horses and would joke about using the purebred manure on my flowers! Looks like you've got champion reining horse manure -- Quarter Horses? You lucky girl! Makes me super jealous to see that pile sitting there. Lumps of gold for sure!!!!! Hi i am new here, just followed your comment. How i wish there is handy compost available like yours. In our area it is difficult to get composts, i have to get/scrape it from our little compost left by few goats. You other plants look very healthy and dont seem to be visited by unwanted insects. Many gardeners will be envious of how things are in yours, gardening seem very simple as the photos tell us! I'm celebrating with your garden!!! 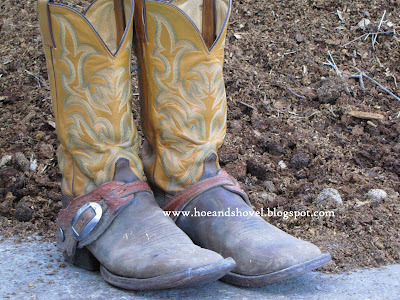 A real life cowboy, is that spurs on his boots? Ah yes, horse poo. This did wonders for us in our garden in Virginia. It is good to know it will do good in Florida as well. Meems lucky lucky you! That is the best manure a gardener can ask for. I used to go to a stable not too far away to collect sacks of this stuff and wished I had a truck. Your plants and veggies will think that they are in heaven. Beautiful stuff for your garden. I'm sure your plants are super happy. What a good son. Does he have any idea how much we admire him for giving his mama this gift? Sons always take care of their moms,don't they?Hope you baked him a fresh batch of muffins! It doesn't take much to make us gardeners happy...compost...rotted leaves...worms...all that wonderful stuff that our sandy soil needs. 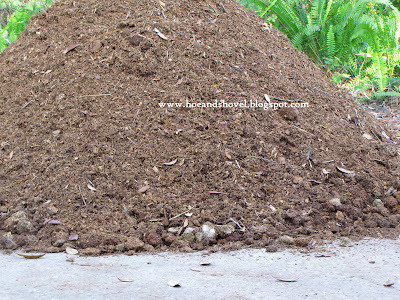 soon we will be collecting piles of that good stuff to add to our compost pile along with some good bunny droppings. love the picture of young j, doing what he loves doing. gotta love the fact he was thinking about what you love to do and brought the best gift ever. What a treat for your son to bring you. No wonder your gardens look so great! Horse manure. How wonderful to have a source of manure. I do love using it in my garden. My sister is starting to raise chickens and I can't wait to use some of her aged manure. Smelly, but good! Cool boots, too! Meems you flowers are going to love you.Natural fertilizer I wish I had it for my beds. What a sweet son to remember your gardens. Feed the soil not the plants. No wonder your garden looks so good! Thank you everyone for your kind words and kudos to my son. He's always been thoughtful and helpful and needless to say we are really proud of him... and thankful for the horse poo, too. Shout outs also to my oldest who bags up all his oak leaves and brings them to me for mulch! I never thought of this before but if I didn't have my son as a resource~~ I'd probably try to find one locally. Anyone could probably find a local horse stable and offer to take some manure off their hands. Each horse produces a LOT of manure and stalls are cleaned out regularly along with the used shavings. Cameron, yes, he rides and trains quarter horses. Kimberly, there wasn't the faintest odor with this pile~~I'm guessing it was due to the fact it was so broken down already. subterranean critters are thanking you. Kudos to the man child. Cool looking boots too!! Let me get this straight. Your son saw a big load of manure and immediately thought of you. You must have beaten him as a child. What a great "gift" from son. Sure is nice he looks after mom. Little helper sure is growing. Won't be long he will be doing most of the gardening. I'm pretty sure I could hear the earthworms munching. It's so nice when they are all grown up isn't it! It was the week for me highlight my boys it seems... all of them make me smile... the big ones and the little ones. i have to say i got a chuckle or two from a couple of your commentors on this post of horse droppings - very funny, thanks to Betsy and Grumpy Gardener! at least this manure stuff is good for something in the very end! LOL! Glad to have done it mom. Love ya. It was worth it just to make the blog!! Did you mean to say... "in the very end?" Ha! Great big hugs to you, my sweet!